Visit Skegness peaks at over 19'000 unique visitors every month over the summer period. With Banner Advertising and Picture Listings or even your own page, Visit Skegness can advertise your business. 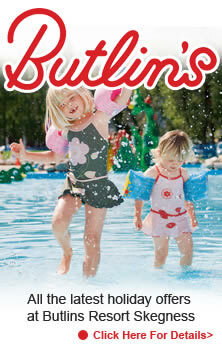 In 2012 Visit Skegness has reached monthly figures as high as 19'500 unique visitors. Most of our traffic is looking for either accommodation, attractions in Skegness or places to eat as the site ranks on page 1 of Google for all of these terms. If you have a website or a business on the Lincolnshire coast, Visit Skegness could lend a real helping hand in boosting visitor numbers. Don't just take our word for it, why not bolt Google analytics into your website to monitor the traffic Visit Skegness sends through to your site. (we can help you do this). Visit Skegness has now joined forces with Skegness.net, the most successful website in the history of Skegness having held the No.1 position for over 10 years. If you want to make a big impression a picture listing is recommended! For a small annual fee of £60 get your business is listed at the top of your relevant page with an image, email address, phone number and description. Also receive statistics each month to let you know how well the advert is performing. The final option is a Banner Advert, banners are found above the picture listings on each page and are priced at £90 for 3 months of advertising. Please feel free to call today on 01754 896989 or email us by clicking here to register you interest. Send mail to webmaster@skegness.net with questions or comments about Skegness Website Advertising.